After attending Me first training, all attendees are eligible to become a Me first champion. continues to reflect on and develop their own communication skills through self-reflection and CPD (continuous professional development) and encourages peers to do the same. helps to keep communication with children and young people high on the agenda in health and social care. shares resources, ideas and successes or challenges within the network to help improve communication with CYPs. 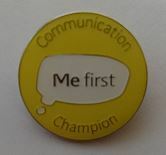 A shiny Communication Champions badge! Please register here if you would like to attend one of the free network events.